An open-top chamber experiment was carried out from April through October 2006 to examine the effects of elevated (80 nmol mol−1) atmospheric O3 on Ginkgo biloba (4-years-old) in urban area. The air with ambient O3 (AA, ≈ 45 nmol mol−1) was used as control. The leaf mass and size, leaf area index, net photosynthetic rate (P N), apparent quantum yield, transpiration rate, and stomatal conductance were decreased by elevated O3 (EO) exposure. Visible foliar injury, which is light-brown flecks, was observed in the EO OTCs after 90 d of exposure. Carboxylation efficiency (ΦCO2) and photorespiration and dark respiration rates were enhanced by EO exposure in the first half of the season, but all of them turned to be lower than those of the AA control at the end of experiment. Stomata limitation of photosynthesis was significantly higher than control in the whole season (p<0.05). Chlorophyll (Chl) content was lower in EO variant than in the control and the difference became more and more apparent through the season. Hence the decrease in P N of G. biloba exposed to EO was the result of both stomatal and non-stomatal limitations. 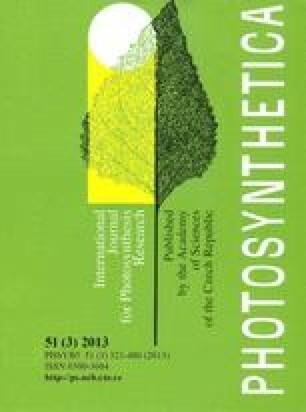 In the early season, the inhibition of photosynthesis was mainly caused by the stomatal limitation, and the earliest response was photoprotective down-regulation of photosynthesis but not photodamage. However, at the end of the season, the non-stomatal limiting factors such as decrease in Chl content, decrease in ΦCO2, and anti-oxidative enzyme activity became more important.